This document will walk through creating a quiz within captivate and having it export a SCORM (Sharable Content Object Reference Model) object to the LMS. Captivate CS9 has the ability to test a user's knowledge and then export that data via a "SCORM" (Sharable Content Object Reference Model) object. This data can then be read by most LMS' (Learning Management Systems) and translated into a gradebook score. This document will go over creating a quiz and enabling it to be exported as a SCORM if the creator chooses to. 1. 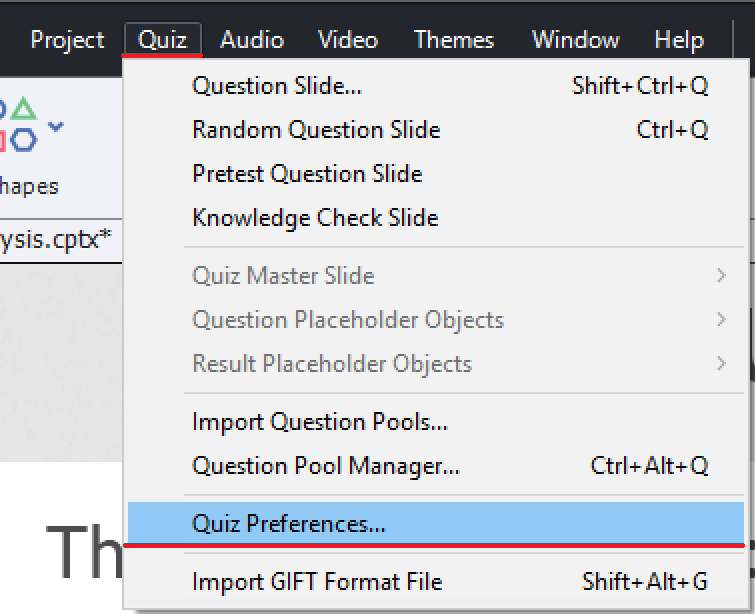 To create a quiz within Captivate, first a quiz slide must be created. 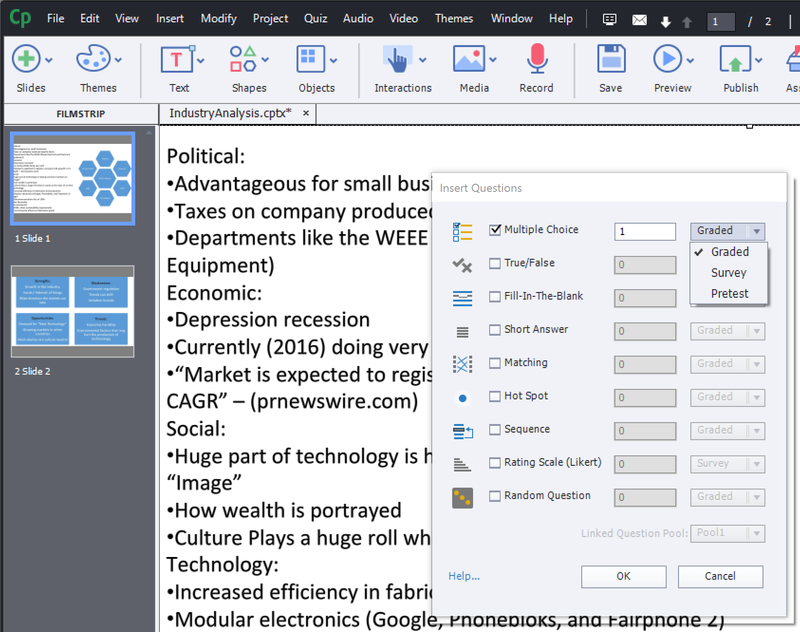 A quiz slide can be added by clicking Slides on the top left of the toolbar, then Question Slide (Figure 1). A new window will open asking how many of each question type you'd like to add (Figure 2). 2. From here you may also select whether this is going to be a graded question, a survey, or a pretest. Graded Question: To evaluate the user using the score you assign for the question. Survey Question: To get user feedback. Note: Graded option is not applicable for Rating Scale (Likert) questions. Pretest: To assess users’ knowledge about the subject before they take the course. These options change how the score is displayed to the user, as well as how it is reported in the SCORM object. More information about each question type. 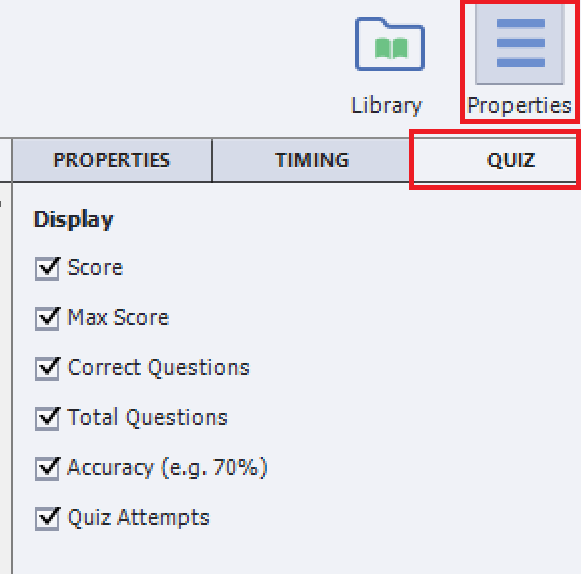 In Captivate, for each quiz question, many properties can be changed. Answers: This option will allow the creator to specify the number of answers that the student has to choose from. Shuffle Answers: This option will change the order of the answers as they appear below the question. Multiple Answers: This option makes it so that the student must select more than one of the correct answers. If the student picks only one of the correct answers they can be awarded "Partial Score" if the option is enabled. Partial Score: This option will allow the student to be awarded partial score if they only identify some of the correct answers on a single question. 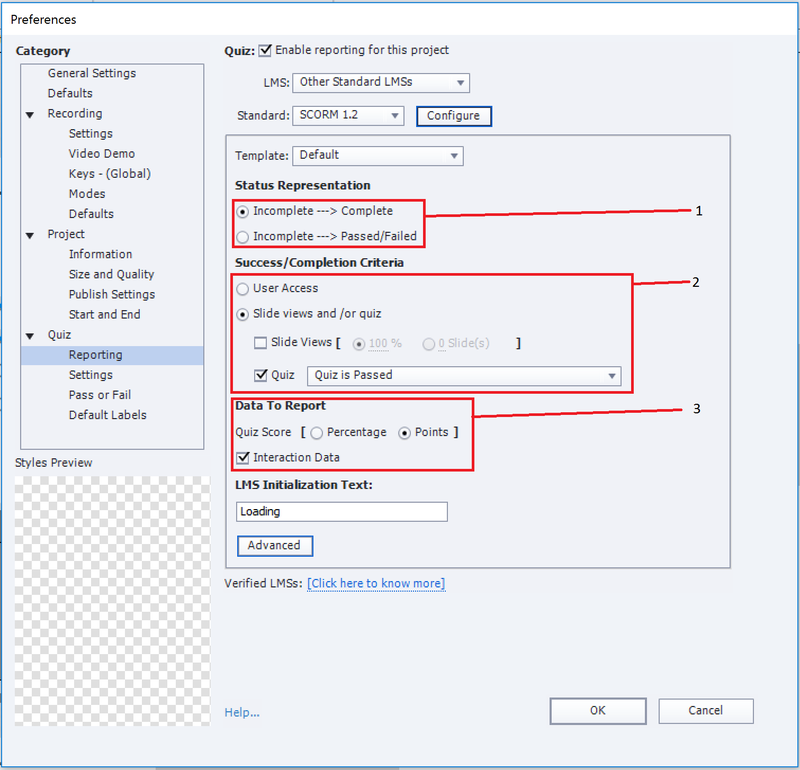 Points: This option allow the creator to specify the number of points the selected question is worth. Penalty: This option will allow the creator to specify the number of points the student will lose if the student incorrectly answers. Captions: This enables or disables the display of "Correct", "Incomplete", or the "Time limit". Buttons: This enables button controls for the test taker to navigate the quiz questions. Actions: This option has a few functions. Firstly, the "On success" option allows the creator to specify what happens when the quiz question is correctly answered. The "No. of Attempts" option allows the creator to change the number of attempts a student has while answer the selected quiz question. Checking the "Infinite Attempts" option allows the student to try as many times on the given question. The "Failure Messages" option allows the creator to turn off the failure messages. The "Last Attempt" option allows the creator to select what happens in the presentation after the last attempt is given (and failed). 'Continue' means to continue onto the next slide, or quiz question. Reporting: Checking this option will allow the quiz answers to be reported (saved) for later use. The ID number is used for referencing the questions that the data came from in addition to back-end scripts. 6. Above are options that will effect the entire quiz (globally) within the presentation. If this quiz is going to be graded, make sure that the quiz Required selection is on Required - The user must take the quiz to continue. For a full explanation of the options visit Adobe's page. Select the quiz results slide. Check or un-check the boxes of the information to be displayed on the quiz results screen. Exporting quiz results to an LMS can be a very useful feature as it allows grades to be automatically exported to the gradebook from the content area of a course. 1. To start, the current presentation must have at least one quiz question with "reporting" enabled. (See the 'Quiz Properties' section above to enable this option). 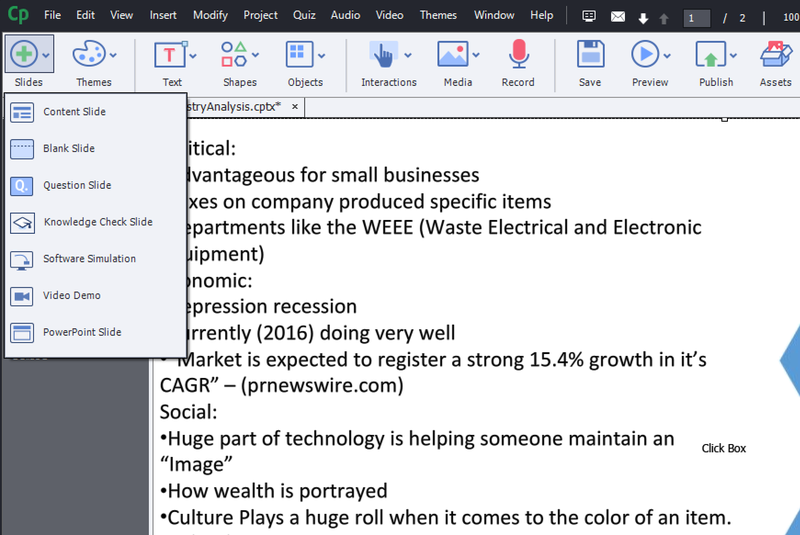 A presentation can report a survey, pre-test, or a graded quiz score. It can have multiple types within the quiz, however the only grade that is sent to the gradebook are the "Graded" type quiz questions. Note: If this is a graded object the quiz properties should be set-up so that the student is required to take it and that they are only allow the allocated attempts. (See the section above on "Quiz Settings"). Selecting this option will bring up a new window (Figure 5). In Figure 5 (above) are the optimal settings for an LMS. The numbered red boxes are the options that the creator may wish to change. This box changes whether the data reported is a "completed" quiz, or whether it was Passed/Failed. This option selected "Complete" will allow the reporting of "quiz attempted". This box determines what signals the quiz score to be reported (what is the 'done' criteria). Selecting slide views means that the student has viewed - but maybe not answered - every question, where "quiz is passed" or "the quiz attempt limit is reached" means the student has answered all the questions. This box determines what data is reported: percentage score or points score, and "interaction data" which is the question attempted by users, and the answer provided them. Note: Some of these features will not be supported by the LMS. Check here for full details about what LMSs are supported. SCORM NOTE: When publishing, select the "Zip Files" check-box to ensure that the document functions correctly. 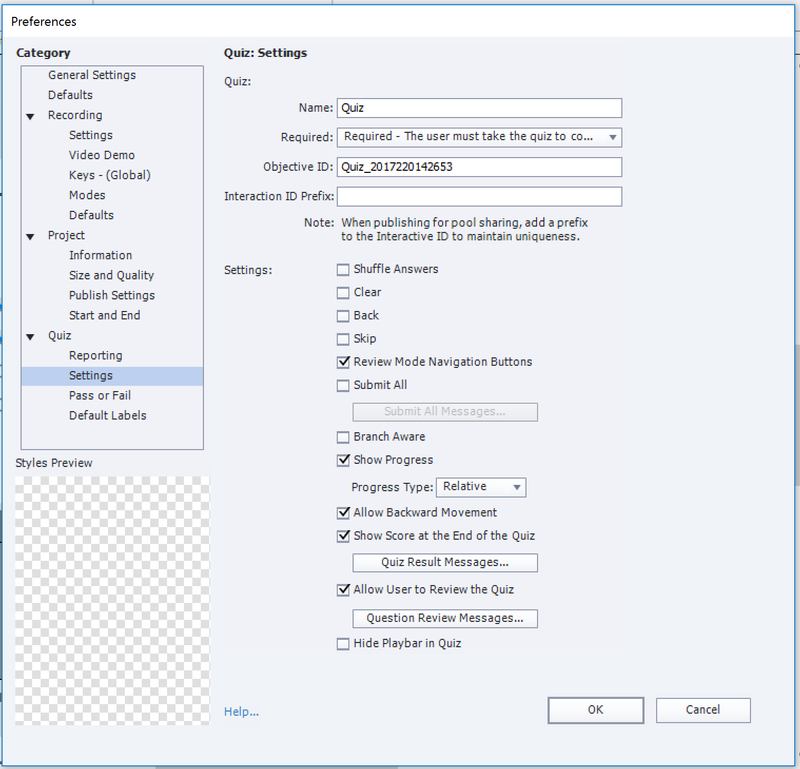 Visit the Knowledgebase article: Captivate CS9 - Getting Started for tips about publishing.